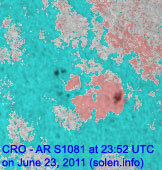 Last major update issued on June 24, 2011 at 04:35 UTC. The geomagnetic field was quiet to active on June 23. Solar wind speed ranged between 560 and 692 km/s. 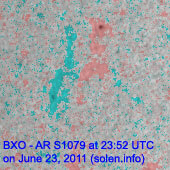 The dominant solar wind source was a high speed stream from CH457. 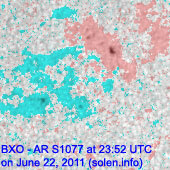 A solar wind shock was observed at SOHO at 02:18 UTC, the same shock front was recorded as a sudden impulse at Boulder 40 minutes later. 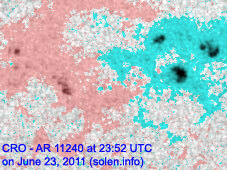 This was likely the arrival of the CME observed on June 21. 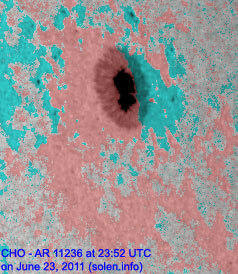 In the presence of a high speed coronal hole stream a CME often breaks down and merge with the other disturbance. In this case the shock front was strong enough to retain some of its CME characteristics. 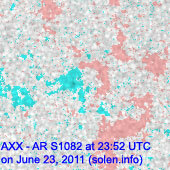 Solar flux measured at 20h UTC on 2.8 GHz was 96.3 (increasing 6.4 over the last solar rotation). 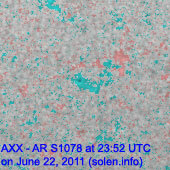 The planetary A index was 18 (STAR Ap - based on the mean of three hour interval ap indices: 17.8). 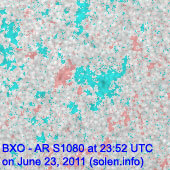 Three hour interval K indices: 44233333 (planetary), 44333233 (Boulder). Region 11236 was quiet and stable. 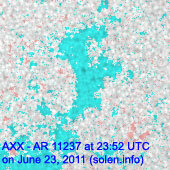 Region 11237 decayed and could soon become spotless. Region 11239 decayed slowly and quietly. 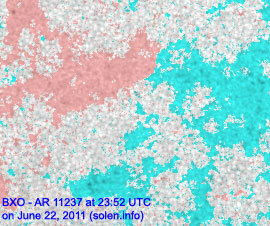 Region 11240 developed early in the day with slow decay observed later as the opposite polarity areas drifted apart. 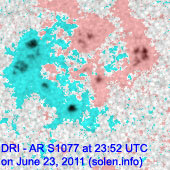 June 22-23: No obviously earth directed CMEs were observed. 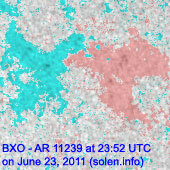 June 21: A halo CME was observed after a C7 LDE in region 11236. Although most of the core of the CME was observed over the northern limbs, Earth appears to be in the path of the southern part of the core. 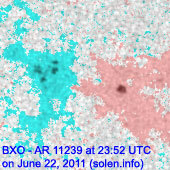 The CME likely reached Earth on June 23. 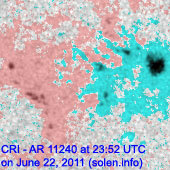 A recurrent coronal hole (CH457) in the southern hemisphere was Earth facing on June 19-20. 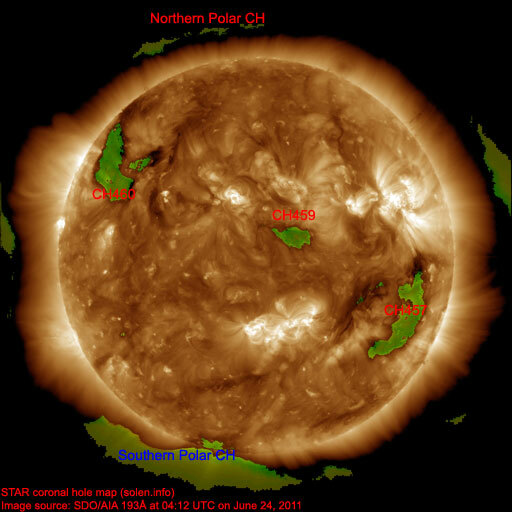 A coronal hole (CH459) in the northern hemisphere was Earth facing on June 23. 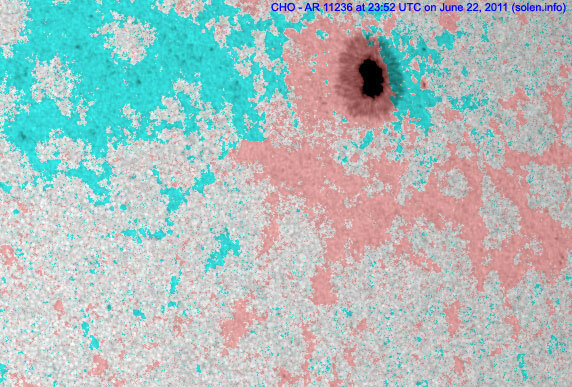 A recurrent coronal hole (CH460) in the northern hemisphere will likely rotate into an Earth facing position on June 27. 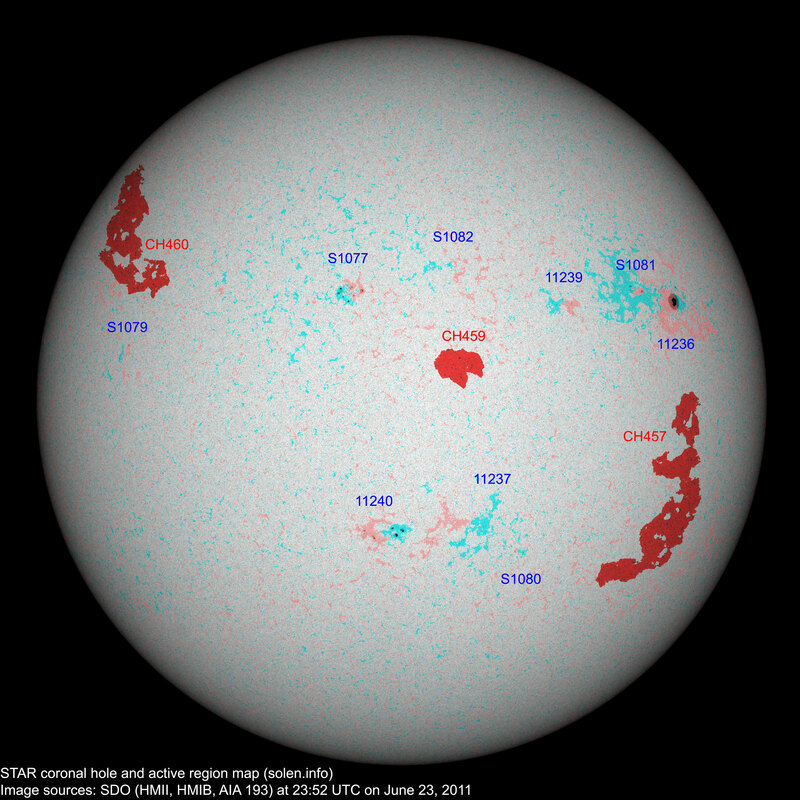 The geomagnetic field is expected to be unsettled to active on June 24 due to combined CME and coronal hole effects. Quiet to unsettled is likely on June 25. Some unsettled and active intervals are possible on June 26-27 due to effects from CH459.